Zoflora was founded in 1922 by Nathan Thornton and Philip Roas. They discovered a niece on the market as the main choice of disinfectant at the time worked well but left a nasty smell. Zoflora was originally created for use in larger areas such as cinemas, factories, dance and concert halls; however people soon wanted Zoflora for use within their home. Zoflora now has a loyal customer following of 2 thousand households. 90 years on Zoflora is still manufactured and packaged within its hometown of Huddlesfield, West Yorkshire. Some of my readers willow know I am a cleaning fanatic with a slight case of OCD. My cleaning side has got bigger since becoming a parent, especially as we have pets. I believe there is nothing better than a clean, fresh smelling home so was happy to agree to doing a review for Zoflora. We were sent a 120ml bottle of the 'Bouquet' frangrence for the review. Although the bottle looks small it goes a really long way. 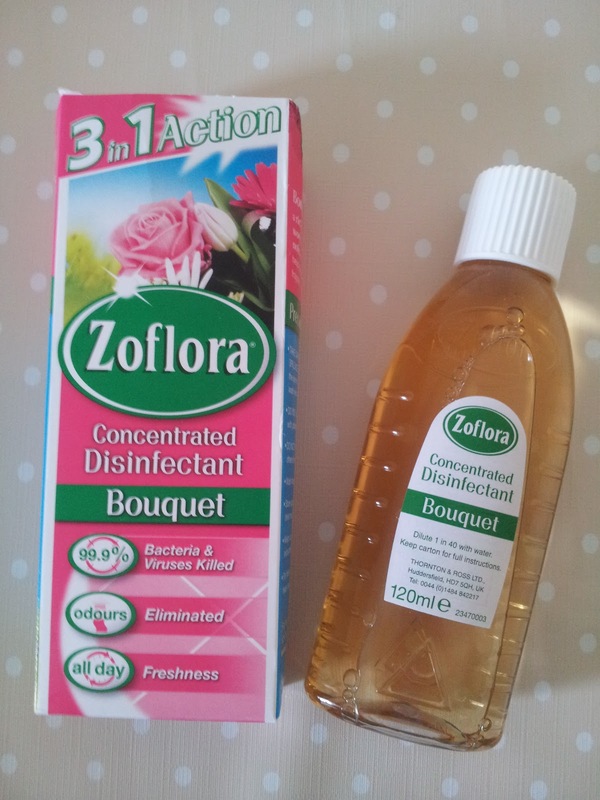 The Zoflora is mixed 1 part disinfectant to 40 parts water. We used the Zoflora in both the dog pen and within the kitchen and bathroom. Firstly I let my partner use the Zoflora within the dog pen to wash them out and disinfect it. He found it brilliant, not only did it remove the very strong dog smell (outdoor dogs smell) it also disinfected the pen at the same time which was great, two jobs in one. When we went to the dogs later in the afternoon the pen still smelt lovely and not too overpowering for the dogs. I also used the disinfectant within the house to mop the floors. When you first open the bottle you think it is strong, but once diluted its a lovely floral/orient smell. Seem of the cleaners I use to clean the floors can often leave streaks, however Zoflora didn't and also left a lovely smell behind. If a floral smell is not for you, Zoflora comes within a range of 14 different scents. I love that the little bottle goes a really long way, yet does not break the bank. Zoflora disinfectant can be used for a variety of situations so eliminates a variety of bottles stored within your cleaning cupboard, always great when you have kids! When correctly diluted Zoflora may be used where most pets are kept. It will kill bacteria and eliminate unpleasant odours. Do not allow pets to lick or walk on wet treated surfaces. Keep off until dry. When disinfecting pet toys, finish by rinsing in cold water and drying thoroughly. Not suitable for use in vivaria or other housing where reptiles are kept. Please Note. This product was sent to me by Zoflora for the purpose of this review, all opinions and wording are my own.